Les manifestations où nous serons présents ! On the plateau overlooking the Loire, the Château de Villeneuve offers stunning views ofthe river wild. Magnificent eighteenth century mansion, it is built in stone which the nobility of the terroir of the region: the tufa. 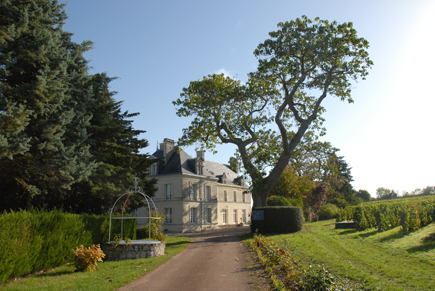 The 25 acres surrounding the property of the family Chevallier give complex winesmarked by a great personality. The work of the vineyard is done in a reasoned: grass growing between the rows withKentucky bluegrass to maximize rooting and water supply to the vine, preservation of natural enemies (typhlodrome, thrips …) to promote integrated pest management and to limit the use of pesticides. Tillage as cantaloupe, pruning and removal of cons-buds to limit yields, harvest green toaccentuate the lower yields in some years.